The INTELLINET NETWORK SOLUTIONS 521871 16-Port Rackmount Console KVM Switch allows easy and convenient access to 16 servers while allowing full control from a single device. Easy and Convenient: With the industry standard 19" 2U height rack drawer, the Rackmount Console KVM Switch can be easily pulled-out and accessed in the extended position, and the display can be foled-down, locked and secured when stored. Full Functionality: With superior KVM functionality, you can can manage and control 16 PS/2 computers from this single device. TrendNet (TK-804R) 8 Port Stackable Rack Mount KVM Switch with On Screen Display - Supports both USB and PS/2 connections to console port, High video quality; up to 2048 x 1536 VGA resolution, Built-in daisy-chain port for cascading up to 8 levels (64 computers), Password protection with Auto timeout logout, Plug & Play and Hot-Pluggable, Standard 19” (1U) rack mount design, Retail Box, 1 year Limited Warranty. The 8-Port USB KVM Switch with On Screen Display (TK-804R) lets you manage multiple computers with just one set of keyboard, monitor and mouse. This rack mount device supports USB and PS/2 interface on the console side and USB interface on the PC side. Users can switch between PCs using hot-key, push button or On Screen Display for flexible management. Hot-plug PCs quickly to avoid downtime. A maximum of 64 PC connections are supported when you daisy chain multiple TK-804R(s).The 8-Port USB KVM Switch is the perfect choice for managing multiple PC's. 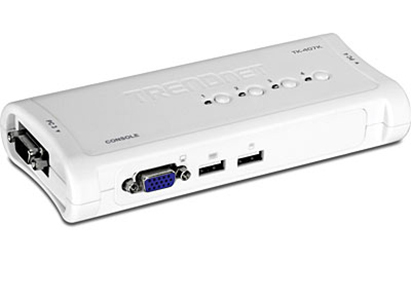 TRENDnet’s 2-Port Dual Monitor DisplayPort KVM Switch, model TK-240DP, allows you to control two computers with one set of console controls. Experience up to 4K UHD resolutions, no driver installation required. The TK-240DP is designed for dual monitor systems with USB mouse and keyboard connections, and features a two-port USB hub to share storage devices or printers between computers. KVM switches are widely used today and can be found in almost every data center. Micronet's KVM switch could handle dozens of computers and allows you to connect multi-platform computers, such as Windows, Linux, Unix and Novell. The Micronet SP226A device allows a user to easily access any of the connected computers via a simple switching action that can be accomplished by a push button or an OSD (on screen display) menu. The 8-Port USB KVM Switch lets you manage multiple computers with just one set of keyboard, monitor and mouse. 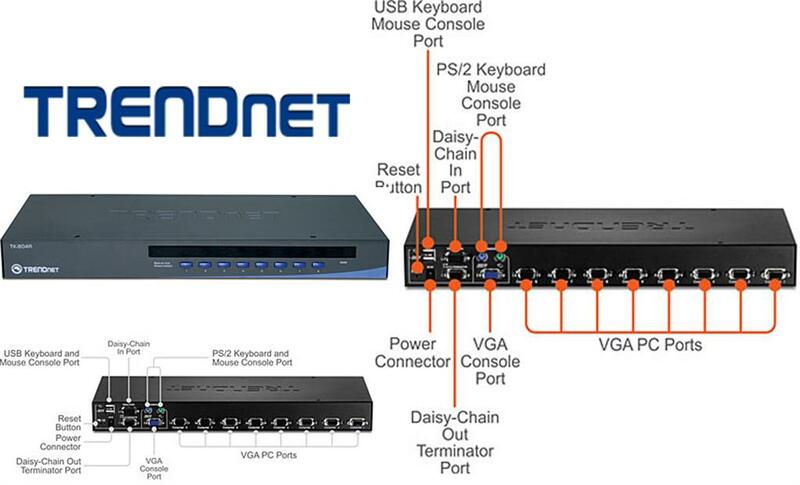 This rack mount device supports USB and PS/2 interface on the console side and USB only on the PC side. Popular hardware platforms such as PC, Linux and Mac are supported. Users can switch between PCs using hot-key or push button for flexible management. Users can also hot-plug PCs on the fly to avoid downtime. 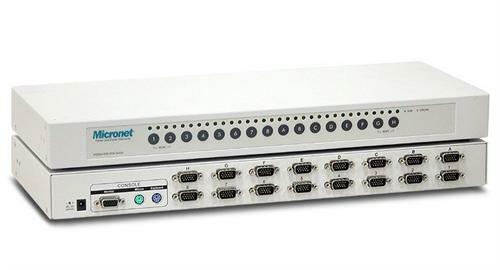 The 8-Port USB KVM Switch is the perfect choice for managing multiple PC’s. The MANHATTAN KVM Switch is a four-port compact KVM Switch with audio and mic switching functionality. Its USB support on the console side allows you to use a USB keyboard and mouse. It comes with four sets of detachable USB KVM combo cables and four sets of audio/mic cables for SOHO and office desktop multimedia applications. And it allows you to access, control, boot and reboot four USB-enabled multimedia computers with only one USB keyboard, mouse, monitor and an optional speaker set and microphone. The audio and microphone switching function of the KVM Switch allows you to leverage the multimedia systems on each of your two computers. You can monitor the audio/mic input/output of each computer without plugging on and off the audio/mic cables. User can also choose to use either independent/simultaneous switching of both PC channel and audio/microphone channel for their maximum convenience. And it takes only one set of speaker and microphone instead of one set for each computer. This KVM Switch saves you cabling troubles with its four x 1.5 m detachable KVM connection cables. In fact, you have zero cabling troubles since you don’t have to worry about finding suitable cables to fit — they come in the package! The TrendNet (TK-409K) 4 Port USB KVM Switch Kit with Audio lets you manage 4 computers with just one set of keyboard, monitor, mouse, and a set of speakers/microphone. The device comes with 4 sets of USB KVM and audio cables, no additional equipment required. Its compact size makes it ideal for home and business environment. The 4-Port USB KVM Switch lets you manage four PC’s with just one set of keyboard, monitor, and mouse. Switch between 4 PC’s with a simple press of a button! Separate sets of KVM cables are included with the KVM Switch, so users can start controlling 4 PC’s instantly. The KVM cables also provide power to the KVM Switch, eliminating the need for a power adapter. Hot Key operations provide immediate access to features such as computer switching, and auto-scanning. With its Hot-Plug, and Audible Feedback, the 4-Port USB KVM Switch is the perfect choice for managing multiple PC’s.